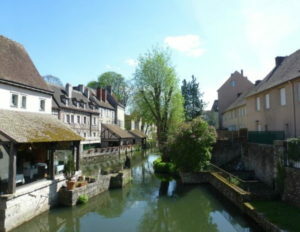 Just 50 kms southwest from Paris, Chartres is within easy reach if you’re visiting the capital. Notre-Dame de Chartres looms over the surrounding countryside and its tall spires are clearly visible as you approach the town. Its inscription as a UNESCO World Heritage site in 1979 describes it as being “the high point of French Gothic art”. 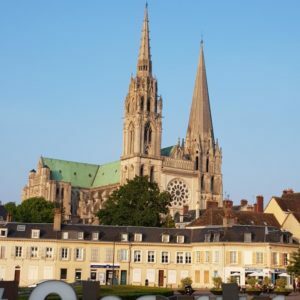 After recent restoration to both the interior and exterior, Chartres and its delightful town is a must-visit for all lovers of medieval architecture. Construction of the Cathedral commenced in 1145 and is regarded as one of the most authentic and complete works of religious architecture of the early 13th century. Earlier churches going back to the 4th century AD have occupied the same site. 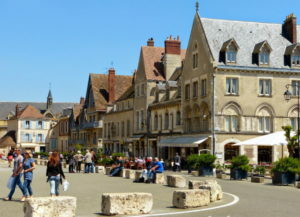 St Bernard of Clairvaux preached the Second Crusade there in 1146, and later in its history, Chartres was the coronation site of Henry IV in 1594. The present Cathedral was built between 1194 and 1250. An early cathedral became a major pilgrimage destination when in 876 AD, the church received its most famous holy relic, the Sancta Camisa, from a grandson of Charlemagne. Said to be the tunic worn by the Virgin Mary at Christ’s birth, the relic is still housed today in the cathedral’s treasury, attracting large numbers of the faithful. Scholars and secular visitors have long come to soak up its history and study the Cathedral’s architecture. Its soaring, vast, nave and porches adorned with fine sculptures, and most especially the stained glass windows, combine to make it a masterpiece. Typical of the medieval cathedrals, it was the most important building in town and the centre of its commercial activity, which in modern times would be conducted in civic buildings. In medieval times, the cathedral functioned as a marketplace, where different commercial activities took place in the various portals. 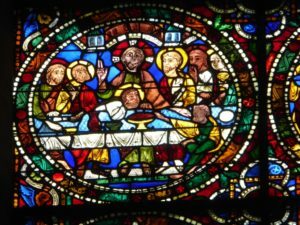 Textiles were sold in the north transept, while meat, fruit and vegetables were grouped around the south porch. Money-changers’ benches, or banques, were located at the west portal. This was an essential service at a time when towns had their own currency. Wine sellers congregated in the crypt in order to avoid taxes imposed by the local lord, and also avoid disturbing worshippers. Casual workers and various professions gathered at particular locations in and around the church awaiting offers of work. 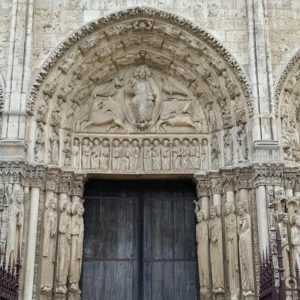 Monuments are often targeted during times of upheaval, and although numerous churches suffered severe damage during the French Revolution, Chartres Cathedral was spared destruction or damage. 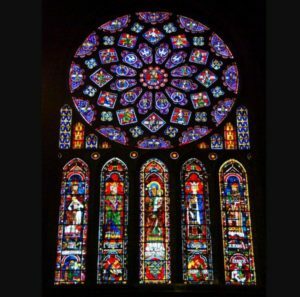 As a precaution at the beginning of World War II, all the 176 precious stained glass windows were removed to safety in 1939. Allied forces believed the Germans were using the spires as an observation post and so orders for the destruction of the cathedral were issued. Fortunately, an American Army Officer, a Colonel Welborn Barton Griffith, was unconvinced. He went behind the enemy lines and established that that the cathedral was not being used by the Germans, so the orders were withdrawn. Restoration of this huge building has been ongoing for nearly two decades. Cleaning and repairing the facades and the nine sculpted doorways started in 1997, while the cleaning and making safe the world famous stained-glass windows has been ongoing since 1986. 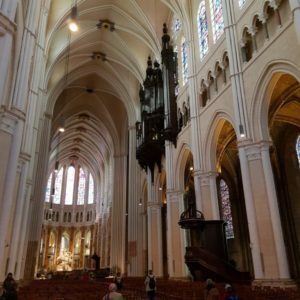 For those who know Chartres Cathedral, stepping inside is now a monumental surprise. Gone is the deep, atmospheric gloom from which the world’s most glorious stained-glass windows glimmered, now replaced by a soaring expanse of luminous white stone. For some, this has been a joyous revelation, but for others, an irreversible loss of the atmospheric patina of history. 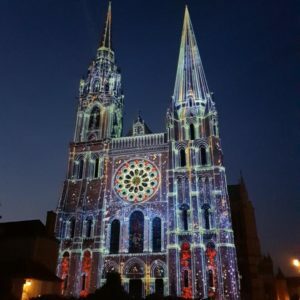 One of the best times to visit the cathedral and town is during Chartres en Lumières, which takes place every Saturday evening–from dusk until 1.00am–from April to October. 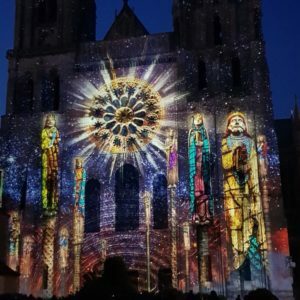 It’s not just the cathedral that is illuminated with spectacular images in dazzling colour, inspired by the narratives depicted in the magnificent stained glass windows. The windows are said to be the world’s largest collection of original 12th and 13th century stained glass. The Cathedral’s spiritual intensity is heightened by the fact that no direct light enters the building. All the light is filtered through the stained glass, whose colours, intricacy and craftsmanship will take your breath away. 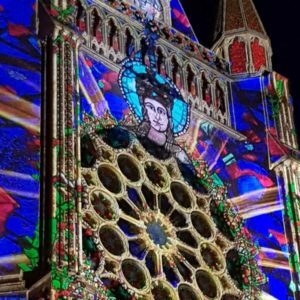 Externally, during the evening illuminations the windows take on a vibrant, active life of their own telling their stories of the building’s construction, as well as famous figures and events from the bible and events in the cathedral’s past. 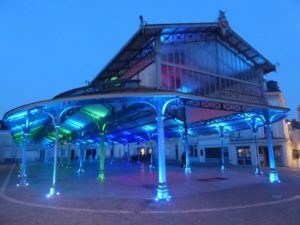 Twenty nine sites dotted around the town are also illuminated with thematic images beamed onto their façades. Some of the sites include the Episcopal Palace, the Italian Theatre, The Musee des Beaux Arts, various bridges and other public buildings, but also washhouses that line the banks of the river Eure that winds around the lower town. It’s worthwhile returning to this area with its bridges and riverbank walkway in daytime, to view the medieval half-timbered houses. Many of these original buildings are still residences while others are local cafes and small, neighbourhood businesses. You feel as though you’ve stepped back in time, as visually at least, little seems to have changed here. As the Cathedral occupies an elevated position, there is a fine view over the town from the gardens behind the cathedral, which is worth taking in during the daytime and at night during the illuminations. 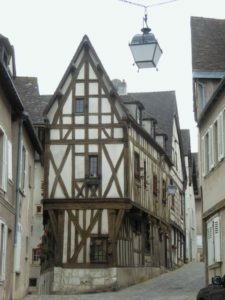 Also near the cathedral on Boulevard de la Résistance, you may spy a house with a wall plaque identifying it as the home of Jean Moulin, the Prefect of Chartres at the time of the German invasion. He became the founder of the WW11 French Resistance, who unified the fragmented resistance movement under Charles de Gaulle. Moulin died in July 1943 while in Gestapo custody, during his transportation by train to Germany. His diary, ‘First Battle’, wherein he relates his resistance against the Nazis, was published after the Liberation, with the preface written by de Gaulle. 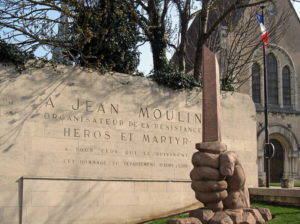 In commemoration of this hero of the Resistance, his ashes were transferred to the Panthéon in Paris in December 1964. 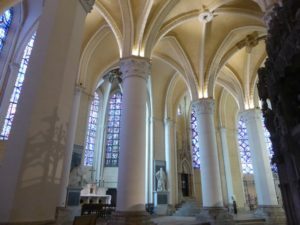 The delightful town of Chartres is more than its magnificent cathedral. 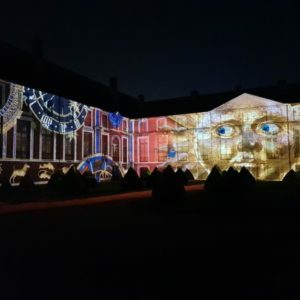 It’s well worth at least an overnight stay to explore all its attractions and enjoy the ambience of this medieval town, especially if you’re visiting at the time of year to experience the stunning illuminations. 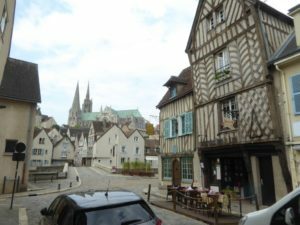 Getting to Chartres from Paris is easy. There are trains hourly from Gare Montparnasse, and depending on the train, journey times are around an hour to 1 hr. 20 mins.